Energy and protein are important in managing frailty, however many older adults struggle to meet their daily protein requirements9. Protein is required for muscle protein synthesis, which could help address the characteristic loss of muscle reserves in frailty10. Download the 'High Protein Nutritional Support: More important than energy?' article for more information about the importance of meeting your patients' protein requirements. Fortisip Extra is a high energy, high protein oral nutritional supplements (ONS). High protein ONS significantly improves energy and protein intakes (without impacting dietary intake), body weight, body composition and handgrip strength, whilst reducing risk of clinical complications11. Frail patients with poor dexterity and muscle weakness may have difficulty preparing powdered ONS to be taken as prescribed, making it less clinically effective and therefore less cost effective. For these patients, ready to drink, liquid ONS may be more suitable. Fortisip Extra comes in a 200ml ready to drink bottle. 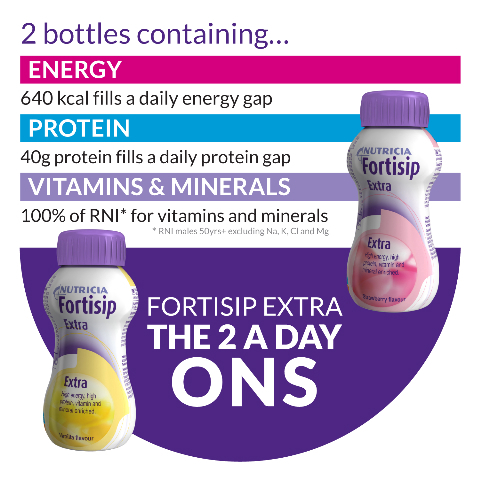 2 bottles of Fortisip Extra per day could help to bridge an energy and protein gap in your frail elderly patients whilst providing all of their daily vitamin and mineral requirements, including calcium and vitamin D to support bone health12,13.